HEADLIGHT RESTORATION The exterior haziness from oxidation is polished out and both headlights are restored to a crystal clear shine. 2 STEP PAINT CORRECTION All painted surfaces are given a 2 step buff and polish to remove light swirls and light scratches, oxidation and other minor paint defects. This process brings paint back and gives it a much deeper gloss and shine. DOUBLE LAYER HAND PAINT SEALANT Better than wax, our paint sealant uses binding polymer monomer technology to produce a water beading, brilliant, long lasting finish. It is applied to all paint and chrome surfaces. It includes UV Protection – it has a combination of a UV filter and UV stabilizers. It has a surface migrating molecule that attaches to the paint surface of a vehicle. Once attached this molecule cross-links and polymerizes on the surface thus building a hydrophobic durable layer of protection. It is evenly hand polished to a shine for great protection. It gives approximately 3 to 6 months of protection. 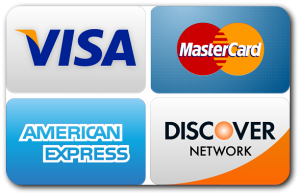 We accept cash, check and cards as form of payment. Prepayment or an Appointment Deposit is required to schedule a service unless otherwise stated. You may pre-pay for service or buy online to purchase a gift certificate.